Leanr how the landscape was shaped in Kirkburton. This is quite an interesting walk, as you will ascend and descend a series of four sandstone units that act as steps as you come into and out of the Thunderbridge Dike valley. This walk will also see you traverse over a number of faults, including the important Kirkburton fault. When you think of faults you may think of dramatic fissures in the ground, but because the faulting activity here was such a long time ago, erosion and sedimentation has obscured much of the evidence of faulting. But if you look carefully, you can still see some clues as to where there has been fault movement, and in which direction. As you walk up Lane Head Lane, you can see the fields on the left almost form a series of giant steps. This is because below the superficial soil layer, there are two flat units of sandstone; the Kirkburton Sandstone and above this the Penistone Flags. Where each sandstone unit finishes, the landscape suddenly drops off until the next unit of sandstone below, forming this step-like pattern. Continuing up the series of sandstones and then back down, you cross in order; The Penistone Flags, The Clifton Rock, the Kirkburton Sandstone, The Grenoside Sandstone, and the Greenmoor Rock. These individual units of sandstone are all physically different and you can pick them out as you descend into the valley from the lay of the land. In the bottom of the valley you come to a bridge crossing aconfluencebetween two streams on Woodsome Lees Lane. You are also crossing the Kirkburton fault at this point, which runs from Birkby to Upper Cumberworth landfill. Although you can’t see the fault plane at this point, there are certain indicators of faulting activity here. The rocks immediately surround a fault have been weakened and are often heavily jointed or even deformed. This weakness is often exploited by river courses, and this is perhaps why we have a valley here that runs along the fault. Faulting occurs because stress from tectonic movement is exerted on rocks. Unlike at depth, rocks on the surface are inelastic, and for the sheer stressto be resolved, the rocks must fracture. They do this along a fault plane, which orients at an angle where the least stress is. The displacement along this fault means that the rocks to the North-East, in Kirkburton have moved down relatively. We call this side the downthrow. Keep your eye out for some flagstone exposures of the Greenmoor rock that can be seen next to Range Dike from Woodsome Lees Lane. Walk past the ruins of Farnley Mill, and try to distinguish the overgrown mill race and series of three mill ponds from the naturally occurring geography. Eventually you will cross a bridge over Range Dike. If you look closely at the exposed dark flaggy sandstone here under the bridge, you will see that there is a series of parallel joints in the rock that run in an east-west orientation. This jointing system is the consequence ofsheer stressesthat were applied to these rocks, which have been resolved through fracturing and faulting. The orientation of these joints is therefore indicative of the fault which runs through here, as both are structurally related. The displacement along the much larger fault will have followed the trend of the jointing system here. Being able to measure these very small insignificant joints call tell a geologist a great deal about the wider faulting history of the area. The next river you come to is Thunder Bridge Dike, and as you cross it you will notice flood defence measures have been installed in the way of stone filledgabions.These are used to absorb the energy from the river and to reinforce the river bank, which is made of a weak shale here and, and is vulnerable to the to the weathering action of the fast flowing stream. You can also see some exposed flags downstream that are unfortunately inaccessible, but have influenced the course of the water. As you follow the path upwards from Penistone Road to Riley Lane you will once again cross over the Kirkburton fault. It follows the road from here to the bridge you crossed on the other side of the circuit. The effects of the fault are more prominent here, as you can see from the valley that Penistone Roads runs through. The displacement has brought the Kirkburton and Grenoside sandstone groups into contact. 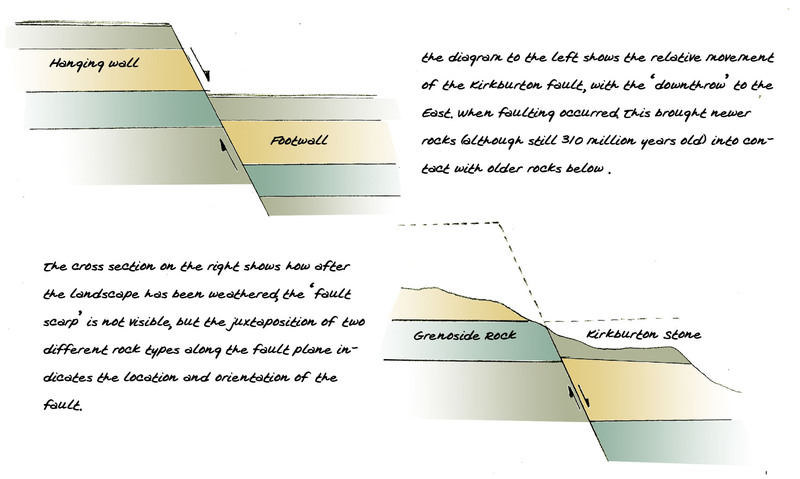 The Kirkburton Stone lies above the Grenoside sandstone normally, so we can confirm here that the downthrow of this faultis to the east as shown in the diagram.